NEWPORT BEACH — The $10.5 million dredging project in Newport Harbor wound down this month, with only a couple of spots left to clean up, marking an end to the project that brought the harbor back to its original design depths. It had taken more than 70 years for the harbor to receive a dredging project of size. Conducted in two phases, the project has reportedly rid the harbor of nearly 90 percent of its contaminated sediment. With the large 180 dredge out of the harbor this week, all that is left to do is tend to any small high spots around the bay, according to the city. A third-party surveyor began an inspection of the harbor the week of Feb. 4. If any high spots are identified, the small dredge that is currently working on two private jobs by the Pacific Coast Highway bridge will clean up those areas, said Harbor Resources manager Chris Miller. “Beyond that, the project is done,” Miller said. 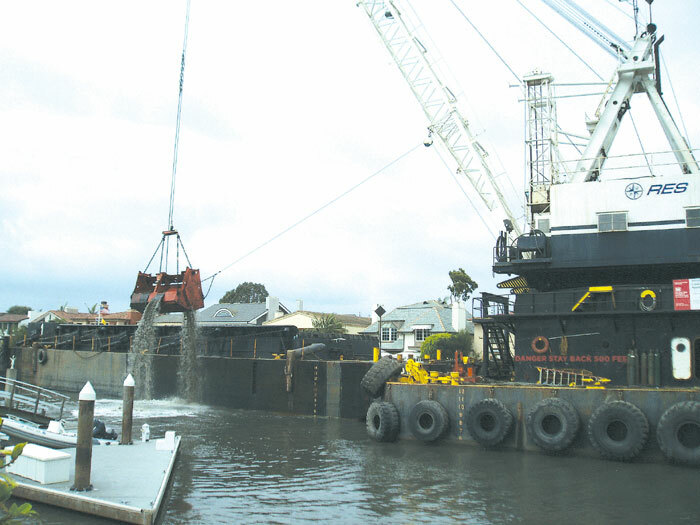 Back in December 2012, dredging was occurring at the area along Lido Island’s Via Lido Nord, with the remaining areas left to be dredged including the federal channel near Balboa Island’s west end, the south side of Bay Island and along Bayshore Drive. In October 2012, the last remnants of nearly 90,000 cubic yards of contaminated sediment marked “unsuitable for ocean disposal” were removed and barged to the Port of Long Beach’s approved disposal site, for use as fill material for new terminal construction. According to Miller, the dredge project took care of most of the high spots in the harbor. Most of the channels are now at -10 feet MLLW and some are deeper; with some channels being dredged to -11 MLLW plus 1 foot over dredge, and some at -17 MLLW (-10 MLLW is the controlling depth). Harbor users have noted the improvements. “I have been told the harbor is cleaner and clearer, because they believe that by taking out the sediment, there is more water flow and better visibility,” Miller said. “In recent months, they have been able to see the bottom of the harbor and are seeing more fish. “It’s very good news,” he said. At press time, South Mooring Co., which installs and maintains the city’s moorings in the harbor, was scheduled to reinstall the mooring balls in the C and G mooring fields, once the survey is completed.